You are here: Home » Impossible requests? Friday, I got an email in regarding this, and this post I put up. It was because both of the image sets were not on the same post. This sort of email appears occasionally and I try and help out with that sort of request. This time, I was going to put my foot down and say Tough! However, I have actually combined both of the posts that I was asked to do in this one. Not together as I would have had to do some major re-writing of the posts and would have had to delete one of them. That wasn’t going to happen! Most of the time the requests to change things that have already been published are because of, either, someone has jumped the gun and sent out information too early, have sent out the wrong item or have the distributor asking them to ask whoever has got the item to change it. Over the years, I’ve seen all three. Back to where this started. 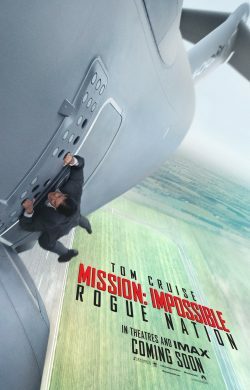 The request was to combine the two sets of character posters for the new chapter in the Mission Impossible franchise. Just click on any of the images in the below gallery to see them full sized. Either that, or just follow the links at the top of this post. With the IMF disbanded, and Ethan out in the cold, the team now faces off against a network of highly skilled special agents, the Syndicate. These highly trained operatives are hellbent on creating a new world order through an escalating series of terrorist attacks. Ethan gathers his team and joins forces with disavowed British agent Ilsa Faust, who may or may not be a member of this rogue nation, as the group faces their most impossible mission yet.